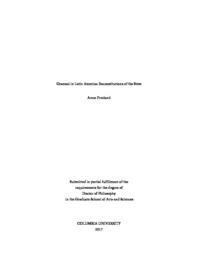 This dissertation traces the reception of Antonio Gramsci’s works over a series of critical moments in the development of the Latin American left, including the transitions to democracy in Argentina and Brazil, Latin American subaltern studies in the academic sphere, and the rhetoric of Pink Tide governments of the twenty-first century, with a focus on Bolivia. My central argument is that Gramsci has appealed to Latin American intellectuals as a theorist of the state—notwithstanding his more frequent characterization as primarily a theorist of civil society—and that the different appropriations and deployments of Gramscian concepts such as the war of position and the integral state have been oriented, in one way or another, toward a defense of constituted as opposed to constituent power, and more generally toward the closure of constituted political subjectivities. The project is intended at once as a study of the historico-political conditions of intellectual production in Latin America, and more specifically as a contribution to the scholarship on the long history of the centrality of the state in Latin American politics, as well as an examination, focused on a particular theoretical field, of modes of appropriation and resignification of political concepts in the construction and contestation of power.